Funny how the United State is nearly five years into the war against Islamic fascism (WWIII, according to Newt), and the government is still inviting citizens of some very unfriendly nations to come live in our country, like nothing has changed. For example, I don't believe FDR was celebrating Japanese culture at the White House 1942-45 the way that President Bush has done with Ramadan dinners. 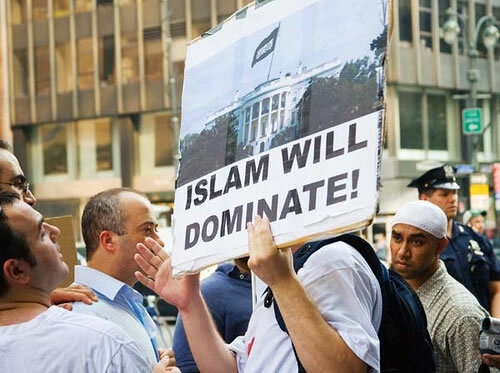 These days, Sons of Allah openly proclaim their intention to overthrow our system of government for Sharia law (see a recent protestor in New York here), yet no one in Congress dares suggest that immigration from terror states be curtailed. Unbelievable. Today's reminder of Washington's incredible arrogance is the announcement of Visa Lottery winners for 2007 — time does fly! Of course we at VDARE.com have long denounced the program as one of Washington's dumbest ideas ever: see Time To Dump The Diversity Visa. Yep, every year Washington puts 50,000 foreigners on the path to eventual citizenship for no other reason than dumb luck. Administered by the State Department, slots are determined by some mysterious algorithm aimed at increasing America's "diversity." As we see from the 2007 slots, being a terror-sponsoring state or otherwise dangerous is still not a reason to stop immigration. How many of those six North Koreans do you think will not be government agents? Remember this — we don't have diplomatic relations with Iran, but our State Department can still manage to hand out nearly 1400 prized immigration visas to the Great Satan. What a country!